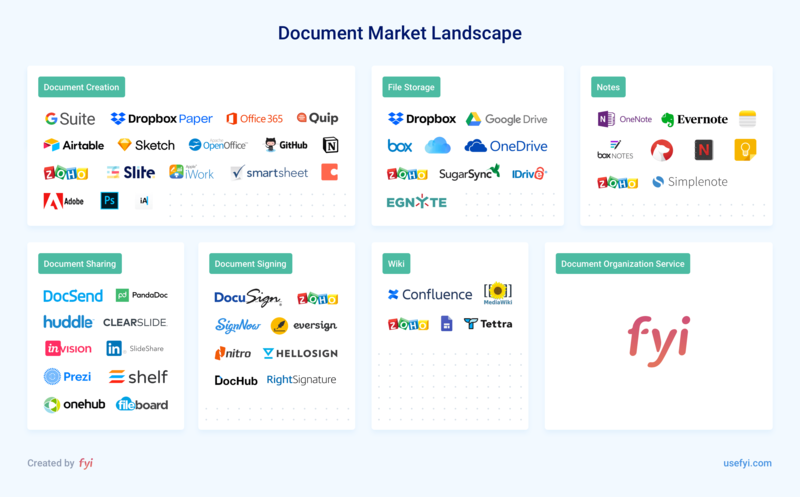 To get a bird’s eye view of the document market, we decided to create a landscape that included as many tools as we could find along with the core categories that they all fall into. Click here to view an enlarged version of The Document Market Landscape. Document creation – Enable the creation of documents in the cloud and on the computer. File storage – Storage of documents in the cloud. Notes – Note taking applications. Document Sharing – Focused on the sharing of documents. Document Signing – Focused on signing of documents. Wiki – Collaborative creation and editing of knowledge management repositories. Once a tool gains traction in a single category, the most popular competitive move is to attempt vertical integration by expanding into other categories. Box, Dropbox, Google, Microsoft, and Zoho have all attempted this same strategy. Instead of consolidating categories into a “winner takes all” scenario, the only outcome has been more complexity and more tools to manage internally. Within companies, tool adoption is a mess. There’s almost always several tools from each category in use by every company and even teams that we talk to. Keeping control of the document workflow is all but impossible. There’s still a healthy amount of innovation within each category. Even with these categories being well established in tech, they all have up and coming tools like Quip, Notion, and Airtable. This adds more complexity and fragmentation to the landscape every year. We did not include document tools that are specialized to a specific industry. PDF conversion and creation tools except Adobe were also not included. Some of the tools cross multiple categories and they’re listed in multiple places where they have a large enough presence. Zoho, Dropbox and Box all have products in multiple categories. We did make a few judgment calls on tools that blend categories, like Confluence and Notion which began as wikis but expanded into document creation. In our research, which has spanned over a year, the number one thing we learned is that documents are scattered across multiple tools and people waste way too much time across our teams. Companies are less productive because people can’t find the documents they need. Instead of working, people are searching for documents, plus messaging and emailing each other to find them. The market continues to fragment and continues to gain momentum as new tools get introduced. We believe there’s a seventh category, a Document Organization Service. We need tools that automatically gather and organize people’s documents from multiple tools in one place so they can find them quickly. That’s why we built FYI. We’re really excited to hear what you think about the landscape. If we missed your favorite tool, please let us know about it in the comments below so we can include it in a future update. And if you have feedback and thoughts on the category classifications, please comment below. Please include attribution to https://usefyi.com with this graphic. What are you waiting for? Get started right now, FYI is ready to make your life more organized. This site requires anonymous cookies and various 3rd-party services to function properly. To continue using FYI, you must consent to our Privacy & Cookie policies. You can opt-out anytime. I agree to FYI’s Privacy & Cookie policies.